In this post, we’re going to be diving into how you can transform the execution of core business processes by integrating simple yet powerful software with your existing property management toolset. 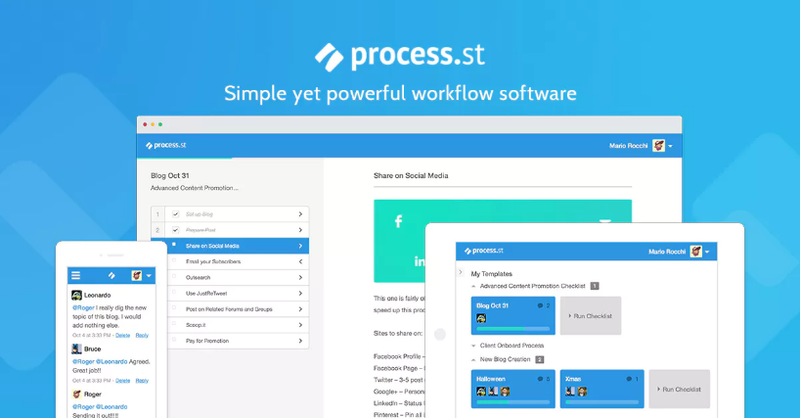 I’ll break down the role of workflows software in improving productivity, address key areas for process optimization, and provide a practical guide to getting started with Process Street including a variety of pre-made workflow templates to get you started right away. I’ll then go through a couple of case studies to illustrate exactly how property management firms are using our software to get tangible results and leave legacy systems in the dust. Finally, I’ll round off the post by discussing the role of business process automation and show you how it’s easier than most people think to get started setting up rules and save yourself from getting bogged down with mundane tasks. One thing you can be sure of is that this is not a purely informative article, rather, it is intended to be of practical use. Along with some information on the real estate market and workflow software benefits, I will provide tools and resources that can help you truly transform the way you execute core property management processes, starting today. The tremendous growth of the real estate software market over the past decade or so is also a clear sign that creating a modern, automated system for documenting processes is an absolute must in today’s business environment. It was recently reported that total investment in real estate tech has ballooned from $33 million in 2010 to more than $5 billion in 2017. That is nothing short of astounding, especially when you consider the market’s volatility over the past few years. In short, technology is driving the evolution of property management, and market players need to keep up if they want any hope of setting themselves apart from the competition. Let’s take a quick look at some of the most popular property management software providers currently on offer. AppFolio is a leading property management software provider that enables the management of all kinds of property including apartments, residences, and commercial real estate. It is an all-in-one solution that includes features such as online owner and renter portals, online applications and leases, online rent payments, built-in tenant screening, maintenance requests, mobile inspections, bulk text messaging, accounting, reporting and a user-friendly mobile app. The software’s rich feature set, intuitive UI, and automation capabilities have received excellent feedback from its users, making it a popular choice amongst property management firms of all sizes, particularly those that are growing at a fast rate and need a tool that will enable them to scale without having to overcome disruptive bottlenecks. 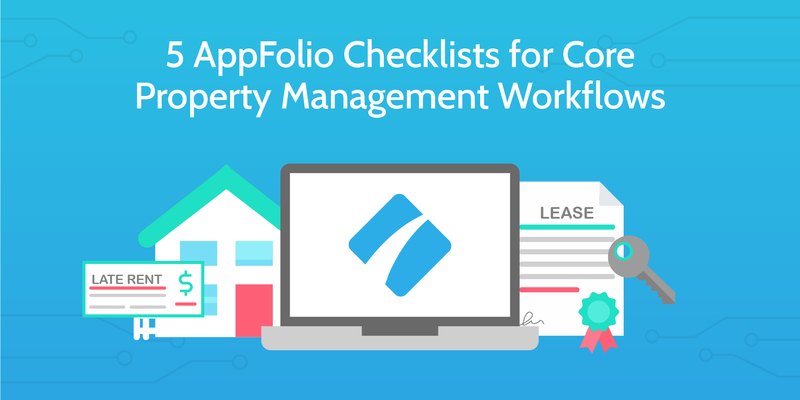 Knowing that many of our property management customers use Appfolio to manage their day-to-day processes, we created 5 checklist templates to provide Appfolio users with an easy to way to improve workflow execution by bringing Process Street and Appfolio closer together. I will discuss these templates in greater detail later on in the post. If you want to check them out right away, click on the image below. One of the main reasons why Process Street and property management software tools like Appfolio are a dynamic duo is because while Appfolio is the central data repository, Process Street tracks the progress of each task involved in a particular process and enables a team to work together from the same source. In other words, while data is constantly being updated in Appfolio, workflow progress is being tracked in Process Street and so everyone is fully aware of what’s going on, and can know with certainty when and what action needs to be taken to complete the process as efficiently as possible. Propertyware, a subsidiary of RealPage, is a cloud-based, end-to-end property management platform that helps you manage the entire renter life-cycle, from online payment processing to customer portals and work order management tools. 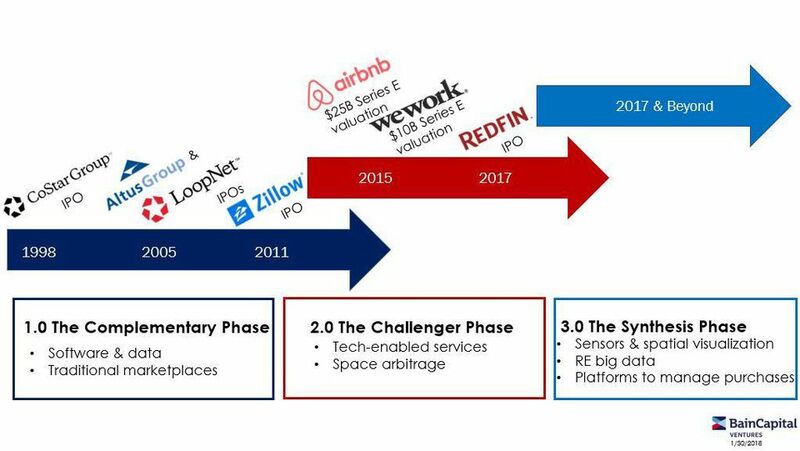 Based in San Francisco, California, Propertyware is one of the oldest full-service property management platforms out there, and has built a loyal customer base of over 2,000 companies. Arguably the greatest unique feature of Propertyware that stands out when compared to other market leaders like Appfolio and Buildium, is that they offer access to their API, enabling users to, in their own words, “customize to their heart’s content”. Customers can create their own dashboards displaying unique KPIs, set up automated alerts or report runs, share data with third-party applications or even import outside data for use inside their property management system. Propertyware also integrates with Quickbooks, so if you already manage your accounting there it could be an easier transition for you to make. Some users have complained about it being overly complex, but there is no doubt it is a comprehensive piece of software that will help you manage any kind of real estate. The team here at Process Street have not yet built any templates customized for Propertyware users, but it is in the pipeline and will be done within the next couple of months. So if you are a Propertyware user, stay tuned! We have some great resources coming for you soon. 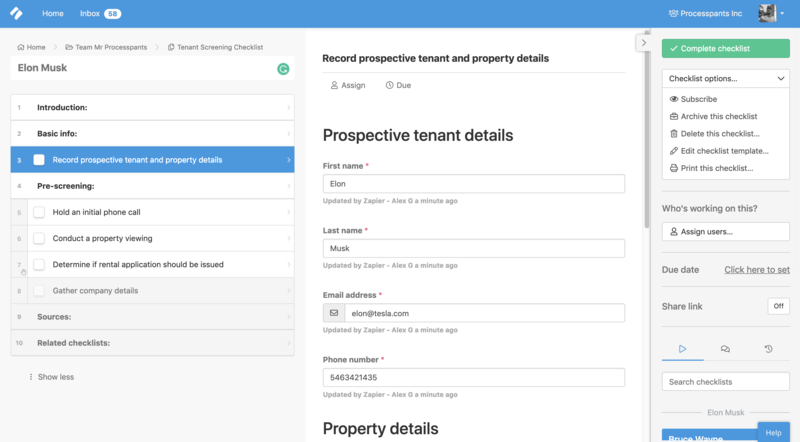 Buildium is a platform that specializes in optimizing the tenant-rental owner relationship by offering customizable rental applications, tenant screening, lease tracking, automated rent collection, and other handy features including a full general ledger for accounting. In fact, some loyal users have commented that the financial reporting is the best thing about Buildium. The software is entirely cloud-based, so requires no additional hardware or software installations and can be accessed from anywhere. As is the case with Propertyware, we have not yet built any templates customized for Buildium users, but we are working on it and will have some released within the next couple of months. 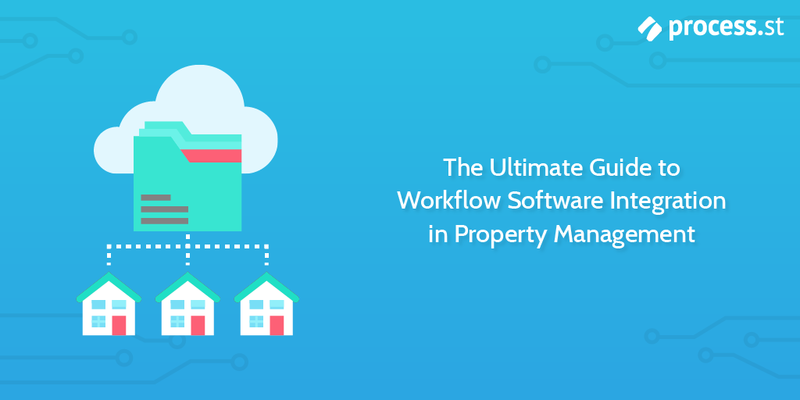 Let’s dive into what workflow software is and how pairing it with your existing property management software can transform the productivity of your team and overall efficiency of your business. Workflow software is simply a centralized digital system designed to help facilitate the setup, execution, and monitoring of your workflows. Setup: Workflow software provides you with the tools you need to map out and create workflows from scratch or even pre-made, fully customizable templates that kickstart the process for you. Execution: Once a workflow has been formally documented, you can assign tasks and collaborate with team members to get the job done without unnecessary delays. Monitoring: This is both from an individual and managerial perspective. Employees have a clear view of their current and upcoming tasks, while managers can see the “big picture” of workflow progression and leverage real-time data to refine and continuously improve processes. Now, a quick overview of the near-term and long-term benefits of incorporating workflow software into your business. I’ll keep this section brief as it’s not really practical, but is helpful to highlight the breadth of impact that such a simple tool can have on business performance. There is a number of key areas that when optimized, have a tremendous impact on the efficiency of property management companies and their relationship with both customers and employees. Here I’ll be going into four of those key areas, and use some examples to illustrate how the integration of workflow software can take business performance to new heights. Like I mentioned in the very beginning of the article, first-class property management really comes down to excellent communication between a range of stakeholders, in particular, property owners and tenants. While this of course requires a significant amount of face-to-face interaction, a lot of communication can be done through the use of workflow software, property management software, or even better, a combination of the two. Why is a combination better than one or the other? Because many workflow management software tools offer features that enable you to send emails, texts, or even call right from within the process you are working through. So, for example, let’s say you are working through a lease renewal workflow in Process Street with a few colleagues. Initial tasks in the checklist like finding and entering details of leases that are expiring soon have been completed. Now, you need to send an email to the property owner notifying them that the lease for a particular property is expiring and needs to be renewed or terminated so the tenant can receive enough notice to vacate the property. Within the Process Street task, an email template can be added to the task info, automatically populated with variable information like the owner’s email address, name, and address of the property. The way the agent working on the checklist can simply click send without wasting any time, and move on to the next task. The same goes for communication with tenants, listing agents, maintenance workers, and any other groups or individuals that are involved in running your company. Data from conversations via email or phone can then be recorded in your property management software, the central data repository, linking back to the checklist from which it was sent. On the other hand, emails can be sent through the property management tool, but by using a digital checklist to manage the process, employees will know exactly when to execute the task. A lot of the work that needs to get done in property management requires a lot of moving around, particularly on the part of leasing agents and maintenance workers that need to be on-site to perform various tasks. Managers need to be on top of travel arrangements and ensure that all relevant team members are aware of what is expected of them, and when they are expected to do it. 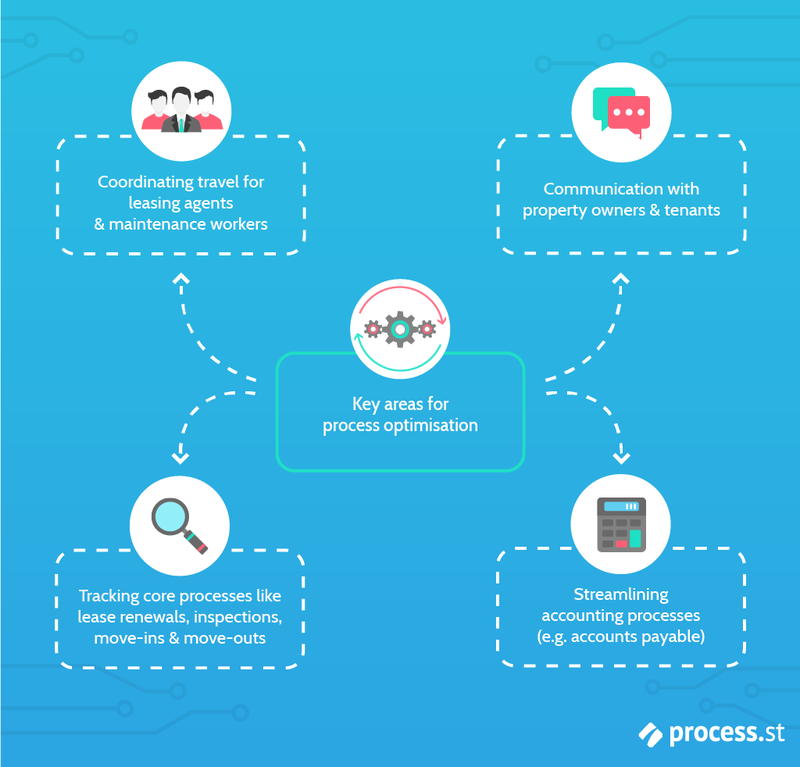 To illustrate how travel can be streamlined through the use of workflow software, let’s take the example of a tenant move-in process. From finalizing the lease to sending a welcome letter, determining maintenance needs, collecting rent, conducting an on-site move-in briefing, and finally handing over the keys, there is a lot to get done in order to ensure a new tenant gets settled into a property in top notch condition. By managing the process through a checklist, leasing agents can communicate with tenants schedule meetings, make travel plans and set reminders all from one place. By receiving email notifications and reminders, agents are highly unlikely to face any unnecessary delays and managers can track exactly what’s going on to make sure everything is being coordinated as effectively as possible. With all of the moving parts involved in managing properties, tracking what, when, and how things are getting done is a key area of consideration for business performance optimization. Managers need to have the tools to gain real-time insight into what’s going on, and from that data, identify any opportunities to refine processes and ultimately improve service delivery for their customers. A bit later on in the post, I will go into how Process Street provides managers with this insight through powerful features like template overview and inbox, but for now I’ll just mention that integrating workflow software with your existing property management software means that every task in every instance of every process can be seamlessly tracked by managers to monitor performance. In other, less confusing words, mapping out and executing processes via digital checklists that can be monitored in customizable dashboards means managers have full visibility into what their team is working on. Every business, regardless of industry, needs to properly manage accounting processes if they want any hope of surviving and ideally, growing their market presence. We have a range of pre-built accounting templates that you can immediately integrate into your processes. If you use accounting software like Quickbooks, Freshbooks, or Xero, you can directly integrate them with Process Street to automate tasks and pass data back and forth between the two applications. From managing accounts payable to creating balance sheets and cash flow reports, we have a host of accounting templates that you can easily integrate into your property management firm’s accounting practices. As I mentioned in a previous article I wrote on workflow software, the key to overcoming this challenge is to start small. Take as much time as you need testing the workflow to ensure everything is working as expected and users understand how to execute the workflow properly. Prior to full implementation, there is nothing better than testing when it comes to identifying opportunities for refinement. Also use testing to determine if any steps/tasks can be consolidated to eliminate unnecessary work, and if other tools in your tech stack can be integrated into the workflow to improve efficiency and reduce disruption. Although there are a set of core workflows that every property management firm has to execute, each company has their own way of doing it. While this may be stating the obvious, the importance of creating workflows that accurately reflect the way your team works must not be overlooked. It’s also essential to make sure all power users have participated in a comprehensive training program to gain a solid understanding of how to use the product and why it is a valuable tool for the company’s growth. That way, not only will employees get the most out of the product, but they will enjoy using it more and advocate its adoption amongst other users that doubt its effectiveness. Once you have conducted sufficient testing, documented results, evaluated ideas for process optimization, and all power users have undergone sufficient training on using the software, then you can begin expanding into other processes, teams, and departments. Workflows are, in many ways, the backbone of business operations, so the last thing you want is to disrupt the way things get done when the intention is to improve it. In one word, the solution is preparation. By taking the time to fully understand the software and train employees, the long-term benefits will be much more noticeable. 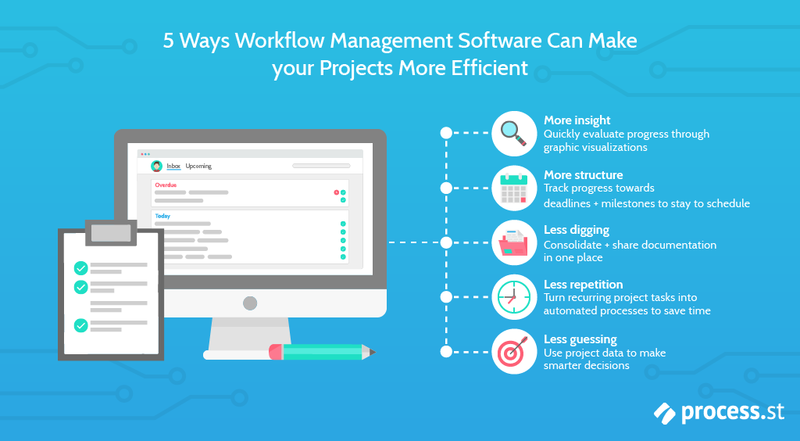 Setting up and building out your workflow software is only half the job. The other half is convincing your team members to properly and consistently follow formally documented processes. Many property management firms are still using legacy systems, like vast libraries of spreadsheets, to manage their processes and it can be a bit of a shock when transitioning to a new piece of software that has a completely different look and feel. The key here is to involve your employees throughout the process of designing, creating, managing, and optimizing workflows. Make it a team activity where collaboration is encouraged and input from team members is valued and discussed with managers. This will not only offer employees a channel for empowerment, but will also improve workflow adoption as they will be built through collaboration and teamwork. I’d recommend having a skim through another article I wrote for some inspiration on how you can involve your employees in process design and improvement initiatives. 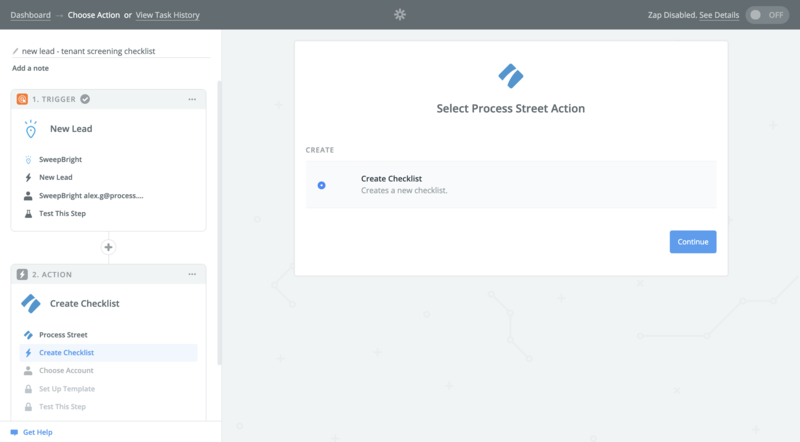 Process Street is a simple workflow management tool that was built to help businesses create, execute, and optimize their workflows. Our mission is to make recurring work fun, fast, and faultless for teams everywhere. By documenting your workflows in digital checklists, you are instantly creating an actionable workflow in which tasks can be assigned to team members, automated, and monitored in real-time to ensure they are being executed as intended, each and every time. The point is to minimize human error, increase accountability, and provide employees with all of the tools and information necessary to complete their tasks as effectively as possible. Each task included in the checklist can contain various details in the form of text, a variety of form fields including sub-checklists, and rich media so each individual working on the process knows exactly what is required and has access to relevant information. If you need to make a change at some point to refine the workflow, Process Street’s template editing system allows quick and seamless edits on-the-fly, without disrupting existing workflows. 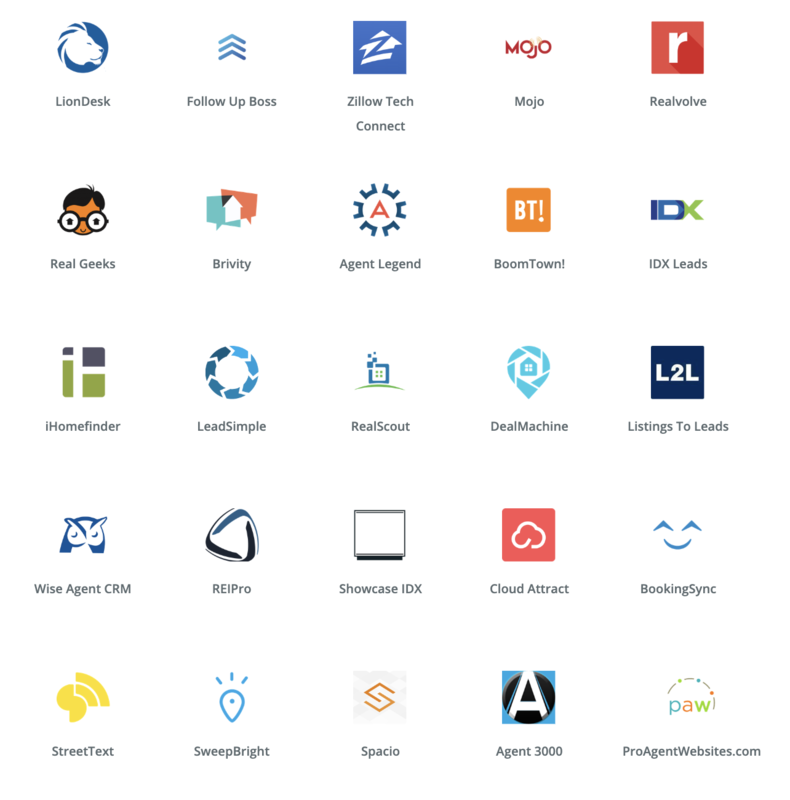 Our extensive integration capabilities allow you to connect with over 1000 other apps, so you can create automation rules between Process Street and the tools you already use to extend the capabilities of your tech stack. Process Street boasts a rich feature set that enables our customers to create intricate digital checklists that meet the demands of their complex processes. In this section, I’m going to highlight a few relatively new features that are loved by our customers and are actively being used by numerous property management firms. Conditional logic is a powerful feature that allows you to create truly dynamic checklists with if/then logic that adapts to your team’s changing needs as a certain workflow progresses. When a decision point is reached in your workflow, the process will branch out to different activities depending on which decision is made. That is precisely what conditional logic enables you to do, so the checklists will automatically adapt to the situation as decisions are made. For example, if you are a property manager contacting a tenant to remind them to pay overdue rent, they may well respond and do so in a timely manner. If, however, they fail to pay for a certain period of time following reminders, you may need to proceed to eviction. Depending on this outcome, you will either end the late rent payment process or proceed to complete a number of tasks necessary for evicting the tenant and putting the property back on the market. A checklist run link is a link which, when clicked, runs a new checklist from a certain template. This allows you to quickly run a new checklist without having to open the template and then click “Run checklist”. Integrate your checklist run links with other apps to make them even more useful. For example, you could integrate the link with your CRM in order to automatically populate the created checklist with data such as your client’s name, company, email address, etc. Variables can currently be added to text and email widgets, providing an easy way of displaying ‘variable’ information that is unique to each checklist. Variable information could include the checklist name, created date or data that was inputted into a form field in that specific checklist run either manually or via Zapier. This lets you automatically surface any information that might be required to complete a specific task. 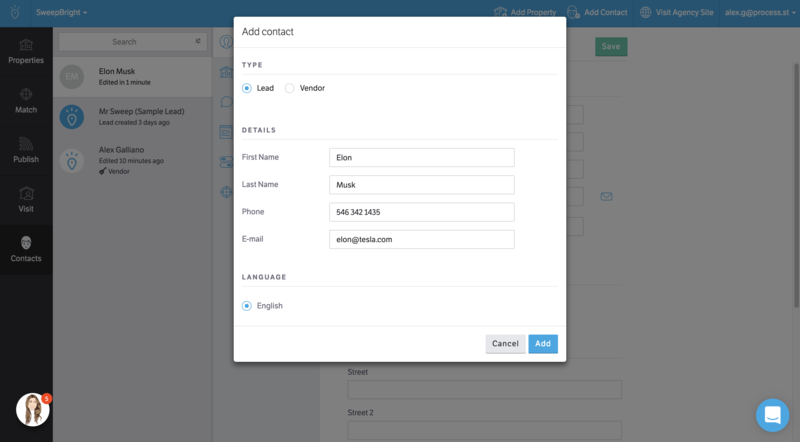 For example, if you record a client’s email address using a form field, you could set up a sample email and then push their email address into the “To” field. That way, the email is automatically populated instead of having to copy it from the form field into your email client. If the email is changed or even updated, the sample email will always be sent to the right place. Now and then it’s important to see an overview of everything that’s going on. There needs to be a way to see a neatly summarized visual of the workflows that have been completed and/or are in progress. For those that are in progress, the overview should show exactly where the process currently is, in the form of how many tasks have been completed and how many remain. Think of it like a spreadsheet that logs which tasks have been completed, along with other useful information such as who completed the task, the date it was completed, and so on. The huge difference is that with a workflow software like Process Street, this is all done automatically without you needing to manually update it. 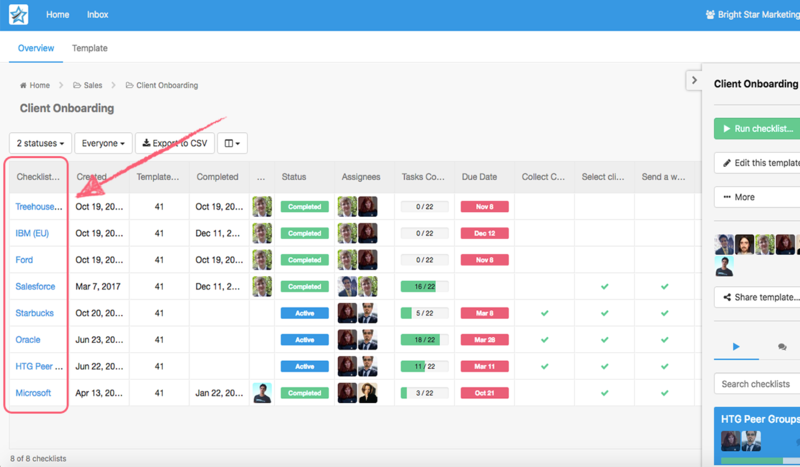 Our template overview feature shows a customizable spreadsheet view of all of the checklists run for a specific workflow, providing managers and employees with an immediate way to see the status of everything in a single view. We’ve created a bunch of templates designed to give you a headstart in creating workflows that can be implemented without weeks or possibly even months of revisions. It’s simply a case of adding the template to your Process Street library, customizing it to fit the way your team works, and implementing it across the company. For example, below is a checklist for screening tenants, one of the most important aspects of property management. We also have over a dozen other templates that I encourage you to check out and see if they could be integrated into your processes. Here is the full list of property management related templates that are currently available. We are constantly adding to this list so stay on the lookout for new templates. I also mentioned earlier in the article that we recently put together 5 templates designed for property management firms that use Appfolio. For example, the upcoming lease expiration checklist with built-in conditional logic, will enable you to manage this critical process, regardless of what decisions are made along the way, as efficiently as possible while keeping Appfolio updated with all relevant information and documentation including communication records. From determining both the owner and tenant’s intentions to conducting a property inspection and (based on conditional logic) creating a new lease or taking the necessary steps to vacate the property, you can use this checklist to make sure every lease that is expiring within the next 90 days is handled appropriately. To get more insight into how property management firms are utilizing Process Street to improve productivity, deliver superior service to their customers, and scale their business, let’s look at a couple of case studies. The first is Dodson Property Management, a Richmond-based property management company which uses Process Street to track the progress of everything from recruitment and onboarding to managing tenants and creating monthly reports for their landlords. They currently manage over 3500 homes with Process Street. 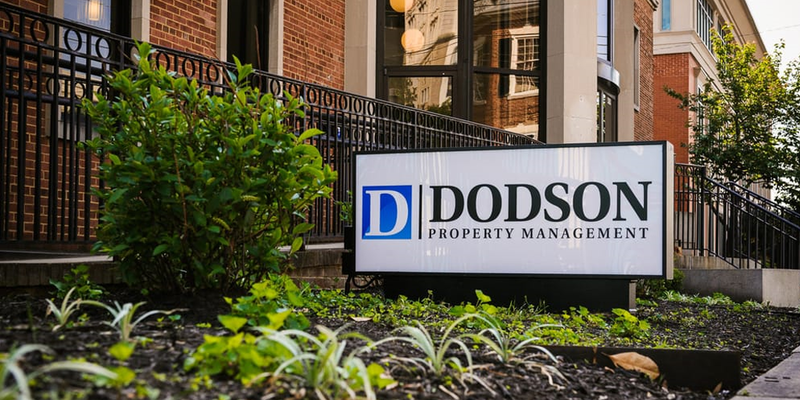 You can read the full Dodson Property Management case study here. Another growing property management company that has benefited greatly from integrating Process Street is Alarca Realty, a Charlotte-based firm specializing in the full-service management of family homes, condominiums, townhouses, duplexes, and small multi-family developments. That’s when they turned to Process Street. Their CEO, Bob Abbott, went through a period of significant research, testing various workflow tools and ultimately decided to go with Process Street. You can read the full Alarca Realty case study here. 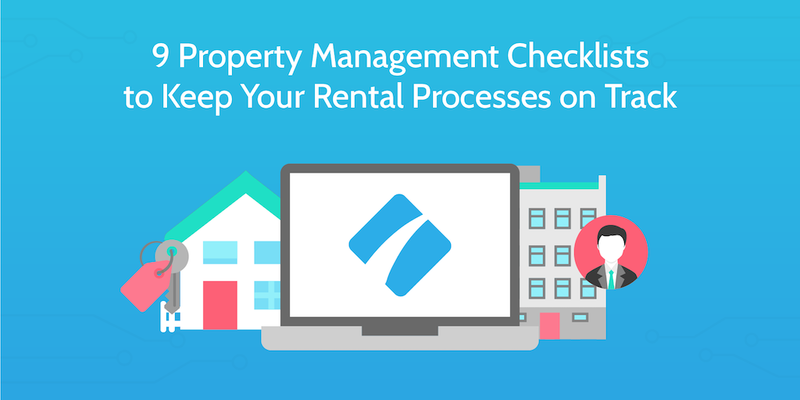 All of the checklists mentioned in this post have been created with the knowledge that property management is complicated and unpredictable, and that you will have your own embedded processes that work best for you. While we do not yet have any direct integration capabilities with the big real estate software providers like Appfolio, Buildium, and Propertyware, there are still thousands of ways you can streamline interactions between various other applications you use like Gmail, Zoho CRM, LionDesk and Zillow Tech Connect. To demonstrate an example use case, let’s say you are a small property management firm that uses SweepBright to manage leads and vendors. 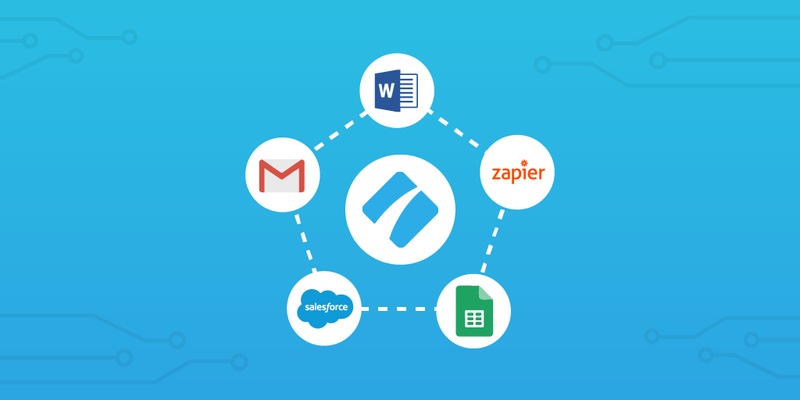 SweepBright’s Zapier integration connects SweepBright with over 1,000 other apps, so you can extend the app’s capabilities by creating your own set of automation rules working in the background. I’m now going to walk you through a simple integration: When a new lead is added to your SweepBright account, the tenant screening process will automatically be kickstarted by creating a checklist in Process Street and assigning it to the relevant team member(s). 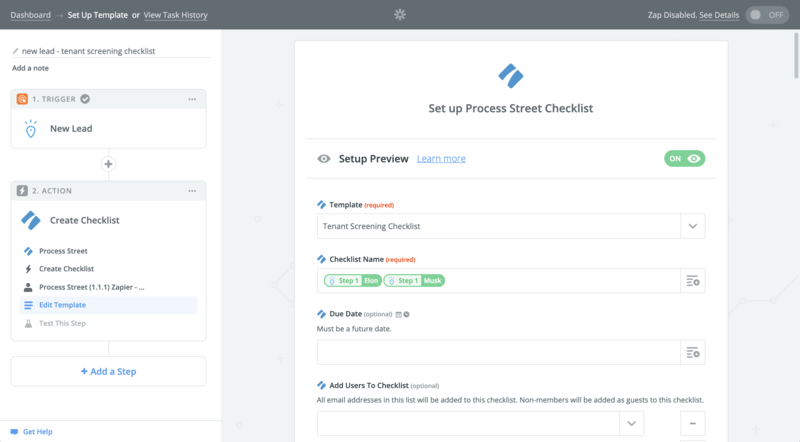 Once you’ve got a free account for all three tools necessary to set up the zap (SweepBright, Process Street and Zapier), add the tenant screening checklist to your checklist library in Process Street. Once you’ve got the three apps up and running, click “Make a Zap!” in the top right corner Zapier’s homepage. Select SweepBright as the Trigger app and “New Lead” as the Trigger. 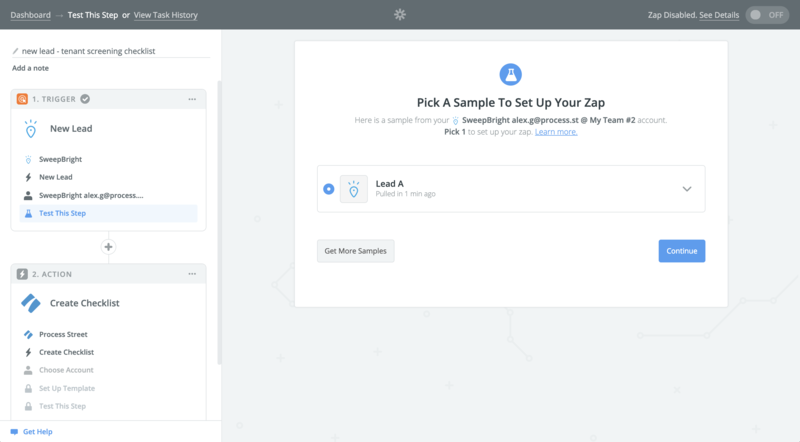 Then, connect Zapier to your SweepBright account and create a sample lead for testing. We’ve created the lead in SweepBright, within seconds it should appear in the “Test This Step” page. Just like that, the Trigger has been set up. Now we move on to the other half of the Zap: setting up the Process Street Action. Select Process Street as the Action app and “Create Checklist” as the Action. 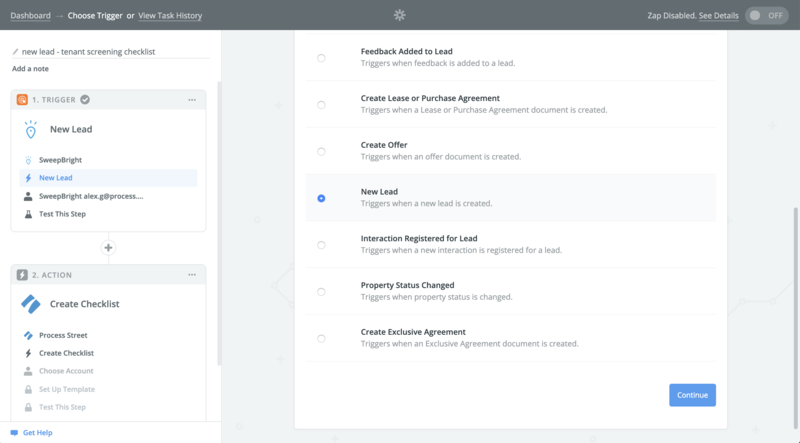 Connect your Process Street account to Zapier by entering your API key, found in the Settings & API tab of the organization manager. Bear in mind, you need to have admin level permissions to have access to an API key. Then, in the “Edit Template” page, select the template you would like to use for the integration, along with various data points that you would like to be automatically passed into the checklist from SweepBright. In this case, the template is called “Tenant Screening Checklist” and I’ve named the checklist after the name of the lead. Basic details including name, email, and phone number have also been added to the checklist by matching them to Process Street form fields. Don’t forget to test the Zap once you’ve completed this section. After confirming a successful test, switch on the Zap and you’re all set! So what are you waiting for? Plug your account into Zapier and see just how much time you can save using business process automation with SweepBright and a host of other property management tools. I hope you found this guide helpful and extracted some valuable insight to improve the way you and your team create, manage, and execute property management workflows. What would you recommend as some of the best ways for property management companies to embrace digital transformation? Let me know in the comments below.